1) On the eve of the fourteenth of Nissan one is required to search one’s home or domain for all chametz (SA 433-1). If one can only perform the bedika either on the thirteenth by day or on the fourteenth by day, one should perform the bedika on the fourteenth by day with a bracha (Emek Tshuva Siman 63). 2) Although the issur of chametz does not begin before the seventh halachic hour on the fourteenth day. Nevertheless, Chazal held that the search must be done in the evening for two reasons. A. Most people are at home in the evening. Therefore, it is much easier for one to perform the bedika and by day one may forget (MB 431-3). B. Chazal held that the bedika should be done by candlelight for it offers a better illumination and one is able to search into all the cracks and crevices (Gemara Pesachim 4a, MB 433-1). 3) One should perform the bedika at the beginning of the evening of the fourteenth (when three stars appear) about 45 minutes after sunset (MA 431-1, MB-1). 4) When the time to perform the bedika arrives, one is prohibited to engage in any work (SA 431-2), or learn torah (however, one may learn the halachos of the bedika(SA 431-2, Aruch Hashulchan-27), eat a meal (however, a light snack is permitted). One may not engage in one of the above within a half an hour before the time of bedikas chametz. The reason for this is that Chazal were afraid that one would become engrossed in the subject matter and become negligent and not perform the bedika in its proper time. If the person engaged in the above before this time, one is not required to stop until three stars appear whereupon one must stop and perform the bedika (Rama 431-2, MB-12). If one started within the half an hour, one must stop what they are doing and perform the bedika. 5) One should not sell their chametz to the rabbi at this time (Shiurim Mitzuyanim B’halacha 111-3, Devar Yehoshua Vol. 2-81 note 2). 6) If a person will not be at home on the eve of the fourteenth, one should appoint a representative to perform the bedika for him (MB 436-1). If no representative is available than one should perform the bedika the evening before one leaves without a bracha, even if one will not return home the entire pesach (SA 436-1, MB-3). Some are of the opinion that the bedika should be performed as one would on the eve of the fourteenth (e.g. Bread, Candle, feather, etc. )(Kinyan Torah B’halacha Vol 2-82), others are of the opinion that they are not required (Minchas Yitzchak Vol. 8-35). 7) Following the bedika one must nullify the chametz which has not been seen (MA-1). 8) If one forgets to perform the bedika at night, one must perform it by day (MB-3). 9) If one goes on a short trip within thirty days of pesach with intention to return before pesach, one need not perform a bedika prior to the trip (SA-1, MB-3). 10) If a person goes away from home more than thirty day before pesach but intends to return before pesach, one must perform the bedika before they leave without a bracha. The reason being that many times one may be delayed and arrive on erev pesach after the permitted time (MB 436-9). 11) If one leaves before thirty days with no intention to return before pesach, although no bedika is required one is required to nullify one’s chametz before pesach (SA 436-1, MB-6). Some Poskim are of the opinion that if one knows that they have chametz in their domain one should dispose of it before they leave, others disagree (MB-5). 12) One who goes to one’s parents for pesach does not perform a bedika in the room that they are sleeping in for they are considered as a guest and not as an owner of the room (Shevet Halevi Vol. 4-44). However, one should make a bedika in one’s home before they go away. 13) Most Poskim are of the opinion that one should daven in shul Maariv at its proper time (at nightfall)(MA, MB 431-8, Chai Adam 119-7, Shulchan Aruch Harav-8) even though the bedika will be performed later. Their reasoning is that it may be difficult to find a minyan later. 14) If one has a set minyan at a later time than one should perform the bedika at its proper time and daven maariv later. Some Poskim are of the opinion that if one will not go to shul one should daven maariv at home prior to the bedika (MB-8, Chock Joseph, Sharai Tzion-11). Their reasoning is that we have a principle in halacha that when two mitzvos come at the same time, the one that is most frequent takes precedent (MB), and one may forget to davin later. 15) One performs the bedika himself or may appoint a representative to assist or perform the bedika for him (MA 432-5, MB-8&11, MA 436-14 & 437-8). Preferably, the person should be over bar mitzvah (MB-8). 16) Any place where one took chametz or ones children possibly took chametz into, requires a bedika even if one took chametz there on an occasion (SA 433-3, MB 433-13, Kaf Hachaim-30). Some examples are the basement, office, car, attic, pantry, furniture, clothing, etc. 17) Many Poskim are of the opinion that those rooms that one sells to a non-jew do not require a bedika (MB 436-32). 18) one who goes to a hotel for Yom Tov is required to check his room, however, a bracha is recited only if one is there on the eve of the fourteenth (SA 437-1). 19) One who forgot or was unable to perform the bedika on the eve of the fourteenth is required to perform the bedika with a bracha during the day when one remembers (SA 435-1, Shulchan Aruch Harav-1, MB-2). One may not engage in any work etc. as stated above prior to the bedika (MB 431-5,433-5). 20) The bedika is performed in the same manner as on the eve of the fourteenth (e.g.. Bread, candles, etc.) (MB-4). The Kol Chamirah should be recited after the bedika is finished (Shulchan Aruch Harav-1). 21) If one is in doubt if they did a bedika on a certain room the room must be bodek again (Aruch Hashulchan 437-2). 22) If one realized after the sixth halachic hour that a bedika was not performed, one must make the bedika but the Kol Chamirah is not said (MB 435-1). 23) If one recited the Kol Chamirah on erev pesach but remembered on Yom Tov that the bedika was not performed, on Chol Hamoed the bidika must be done even by day with a bracha. However, if the Kol Chamirah was not recited, one must perform the bedika on Yom Tov with a candle (MB-3). The chametz should be covered for it is muktzah (Shulchan Aruch Harav-2). BEDIKAS CHAMETZ IS NOT MERELY A CEREMONY IN WHICH PIECES OF CHAMETZ ARE PLACED AROUND THE HOUSE AND COLLECTED. A THOROUGH CHECK AND SEARCH ARE REQUIRED SO THAT THE BRACHA SHOULD NOT HAVE BEEN SAID IN VAIN. 24) One should wash one’s hands before making the bedika however, no bracha should be recited (MB 432-2). 25) The minhag is to place ten pieces of bread around the house (Rama 432). Each piece should be no larger than the size of an olive (ST 432). However, one should have at least the size of an olive when one combines all the bread together (Archus Hachaim -8, Chukas Pesach Hakatzar-8). 26) Hard chametz should not be used for they leave many crumbs (MB-12). 27) Many wrap the bread in paper or place a paper under them. One must use extreme caution not lose or misplace the bread (MB-13). A. In order that the bracha should not be a bracha in vain if one finds no chametz (Rama). Most Poskim deems it not as a bracha in vain for the mitzvah is to search and destroy even if there is no chametz found (Rama). B. Some Poskim feel that by putting out bread it will ensure that one will not forget and nullify the chametz because one will have chametz to burn the next day (Chok Yaakov-12). C. Others state that by putting out chametz one will not stop until all the chametz is found (Chok Yaakov-14). 29) One must realize that the collection of the ten pieces is not to be considered as doing a proper bedika, one must search one’s domain throughly (MB-12, KSA 111-8, Aruch Hashulchan 432-5,433-13). 30) Since today we clean our homes throughly some Poskim are of the opinion that one must place the ten pieces of bread out (Machzik Bracha 432, Sedei Chemed Chametz U’matzah Siman 5-49). 31) Chazal state that one must search one’s domain through candlelight and not by the light of the moon (Mishna Pesachim Perek 1-2, SA 433-1). The reason for this is that if one would search one’s domain during the day, the daylight would be insufficient for one would not be able to search into all the cracks and crevices. It is for this reason that Chazal ordained that the bedika is performed in the evening when candlelight offers a better illumination (MB 431-3,433-1). 32) As we have stated before, if one must perform the bedika by day one must search for chametz with a candle (SA 433-1). 33) One should use a wax candle that is made out of one wick for one would be afraid to go into the cracks and crevice with a torch (Rama 433-2, MB-8&12). 34) Any candle made of more than one wick is to be considered as a torch, therefore one cannot use a havdalah candle for the bedika. 35) A bedika that was performed with a torch is not a valid bedika and one must perform another bedika without a bracha (MB-10, Aruch Hashulchan-2). 36) One is permitted to use a flashlight to perform the search (Rabbi Aaron Kotler Zt”l, Rabbi Moshe Feinstein Zt”l). Some Poskim feel that it is even better then a candle for one is not afraid to search into the cracks and crevices (Shiurim Mitzuyanim B’halacha 111-4). Many Poskim are of the opinion that one should start the bedika with a candle and change over to a flashlight (Rabbi Moshe Stern Shlita). 37) The electric light in the room is insufficient for the bedika, one still needs another light (Yesodai Yishurin Vol 6 Daf 340). 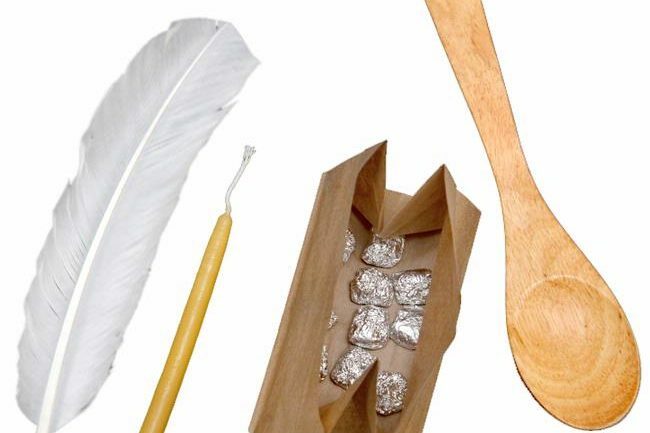 38) The minhag is to search for chametz with the use a feather to assist in removal of the chametz (MA 433-1, MB-46). 39) The minhag to use a spoon is to remove any crumbs of chametz. Some give the reason for the spoon is so that the person will not forget to nullify the chametz. Therefore, since one burns the chametz in the morning it will remind one to nullify the chametz (MB 445-7). Others state that when one burns the chametz one should use wood (Rashash Shabbos Daf 66, Minchas Yitzchak Vol. 2-53, Haggadah Moadim Uzmanim, Chok L’yisrael Daf 38). 40) Some Poskim are of the opinion that the bracha should be recited in the room that the bedika will take place (Emek Tshuva Siman 63). 41) Before beginning the bedika a bracha is recited. One recites “Boruch Ata Adon-ai Aloha-nu Malech Haloam Asher Kidishanu B’mitsvosav V’tsivanu Al Biur Chametz” (SA 432-1). Although at this time one does not destroy the chametz, it is considered as if it is destroyed, since after the bedika one nullifies it. The bracha is not recited on the actual searching of the chametz, but rather on the destroying of the chametz and searching is only a means to get to the chametz. 42) If a person did a bedika but did not get rid of the chametz they are considered as if they did nothing. Similarly, if one did not nullify the chametz after the bedika it is as if they still have not destroyed the chametz. 43) If a person made a mistake and said “L’vair Chametz” or “Al Bedikas Chametz” one is not required to repeat the bracha (Bach, Pri Megadim-1, MB-3). 44) If one forgot to recite a bracha before beginning the bedika, one should recite it as long as the bedika has not been completed (Rama 432-1). If one completed the bedika, no bracha is recited at this time, however, in the morning before one burns the chametz one should recite the bracha (Taz-2, MA-2, MB-4). If one forgot to recite the bracha before burning the chametz, no bracha is recited afterwards (Maharam Shick Siman 208, Sedei Chemed Siman 5-7). 45) One is not allowed to speak between the bracha and the beginning of the bedika, even if it is relevant to the bedika (SA 432-1). However, if one spoke in regard to the bedkia, no new bracha need be recited. If one spoke even one word about something not relevant to the bedika, the bracha needs to be repeated (MB 5). 46) Preferably, one should not talk throughout the entire bedika regarding matters not relevantly to the bedika (SA). If one did, no new bracha is needed (MB). 47) If one will perform the bedika in many places (e.g.. home, car, office) one need only recite one bracha (SA 432, MA-4, MB-7). If one will have a big break from one place to the other, some Poskim are of the opinion that when you recite the first bracha one should have in mind that the bracha is only going on this bedika and does not include the bedika of the office etc. (Mikraha Kodesh Vol Siman 46, Keren L’dovid Siman 59). 48) No bracha of shehecheyanu is recited, for the purpose of the bedika is to prepare the house for pesach, therefore, it is included in the bracha of shehecheyanu which is said on the first night of pesach during kiddish (Tur 432, Machzik Bracha-1, Shulchan Aruch Harav 432-3). 49) If one goes to the bathroom in the middle of the bedika, one may recite the bracha of asher yotzar (MA-4). 50) After one completes the bedika the chametz should be put in a secured place and not moved around (SA 434, MB-2). Furthermore, the chametz that is left to be eaten the next morning must be set aside in a proper place (Taz 436-1). 52) One must understand the language that they are saying, if one is unaware of what they are saying or doing the nullification is ineffective (Rama 434-2, MB-9). 54) One may not perform a thorough bedika on the thirteenth by day to be used as his bedika. If one did, one is required to repeat the bedika on the eve of the fourteenth, however, no bracha is recited (MB 433-1). Some state that one should think the bracha or hear the bracha from a neighbor. 55) if one will not have sufficient time to complete the bedika on the eve of the fourteenth, one may perform the bedika on the eve of the thirteenth, however, one must leave over at least a room that requires a bedika in order to recite a bracha (Sedai Chemed Siman 5). 56) If a person shares their room with a roommate and one departed before the fourteenth, the other person should perform the bedika (MA 436-16). 57) We burn the chametz on the morning of the fourteenth before the end of the fifth halachic hour (MB 445-1). Some have the minhag to burn the chametz at the beginning of the fifth hour (Bach). 58) The chametz should be burned until it becomes charcoal (MB-1). 60) Preferably, one should burn one’s own chametz. If for some reason one cannot one may make representative to burn it for him. 61) If one will not be at home at the time of the burning of the chametz, they nevertheless should say the nullification where they are. 62) Some have the custom to burn the Lulovim and Hoshanos from Sukkos as fuel for the fire because since they were used for a mitzvah it is proper to use them for another mitzvah (MB-7). 63) One should not pour lighting fluid or it’s like over the chametz until some of the chametz is already burning (Seder Pesach K’hilchaso Daf 175). See par 14. 64) One may dispose of the chametz by other means, one does not need to just burn it. One may flush it down the toilet (MA-2, MB-3, Chazon Ish Orach Chaim 118-3), break the bread into crumbs and throw it into the wind or sea (SA 445-1). 65) One should not place the leftover chametz in one’s own garbage can or on one’s property to be removed by the garbage collectors, but they should be placed in plastic bags and put outside one’s property (Rabbi Moshe Feinstein Zt”l Igros Moshe OC Vol. 3-57, Shevet Halevi-137, Minchas Yitzchak Vol 4-53). 66) If there is a time zone difference the nullification and selling of the chametz must take place before the earlier of the two time zones (Rabbi Moshe Feinstein Zt”l). One must make sure when they are selling the chametz that the rav does not buy back the chametz before the latter time zone (Rabbi Moshe Feinstein Zt”l).